Thanks to our long-time cooperation with international musicians we have been able to continually improve the pitch and the efficiency of our instruments. We never forget about the characteristic sound and we are well aware that the perfect instrument has not been made yet. We see ourselves as mediators between the musician and his music. Each of our instruments is 100% handmade and unique. 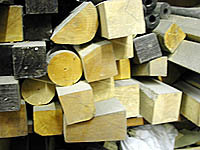 We mainly use European box tree wood and certified FSC Blackwood. The instruments presented on this site have all been tested and tried in concert situation.